Future Feminine is a new group exhibition navigating the female gaze in 21st century photography – and looking forward to what the future holds. To celebrate the opening at LA’s Fahey Klein Gallery this week, we meet the participating artists – Honey Long and Prue Stent, Magdalena Wosinska, Amanda Charchian and Remy Holwick – to take a closer look at their work. “I would photograph an idea rather than an object, a dream rather than an idea,” Man Ray once declared, and few artists will espouse the Surrealist master’s philosophy more wholeheartedly than Amanda Charchian. “I’ve realised that the strength of my imagery lies in the intangibility of what I’m trying to capture, which tends to be intimacy and my connection with the subject,” explains Charchian, whose sensual visual reverie works its magic sotto voce. The LA-based photographer’s background may be in conceptual art, but little of her mentors’ 70s Californian minimalism finds its way into her hyper-visual frames. “I’m definitely more of a maximalist,” she says. “I’m not really one to break down and minimise the form and content of my work.” Instead, the challenge she wants to embrace is allowing herself to make work about pure emotion, letting both her personal and aesthetic guards down. “There is something incredibly strong about letting yourself be vulnerable as a human or an artist,” she argues. “It means you’re living life to its maximum potential instead of being careful all the time.” To the 29-year-old photographer, the latent strength of vulnerability truly shines through when observed through the lens of femininity, intimacy and love. In Future Feminine, an all-female group exhibition held at LA’s Fahey/Klein Gallery, Charchian embarked upon a mesmerising photographic exploration of intimate relationships as categorised by Canadian psychologist J.A. Lee’s modern interpretation of Greek philosophical notions of love. 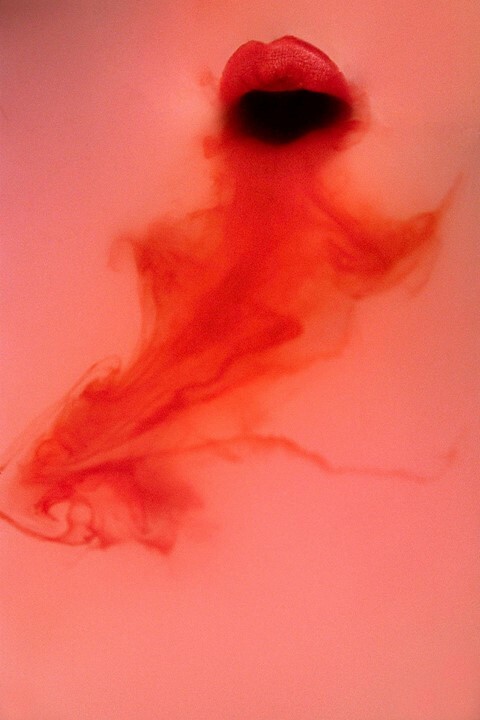 A crimson moonscape and a floating mouth emptying an ectoplasmic substance through pink water visually translate the concept of ‘agape’ – the selfless, spiritual, divine love. Two blue eggs held by chained gloves over a woman’s pelvis symbolise ‘pragma’, a practical kind of love grounded in duty and reason. For ‘eros’, a sensuous glimpse of two intertwined lips illuminates the construct of passionate, romantic love. The series is completed with images portraying ‘philautia’ (self-love), ‘mania’ (an obsessive, possessive love), and ‘ludus’, which encapsulates the idea of courtship and unrequited desire. Creating realistic documentary likenesses clearly isn’t Charchian’s creative mantra – but in her world, art and life are inextricable. “Intimacy is a common thread in this recent body of work, I’m kind of obsessed with it,” she says. “But I can only truly understand it through my own personal experience of being a woman in relationships, dating, and constantly testing the boundaries of my own vulnerability. My work is always a bit of a self-portrait.” Art may imitate life, but Charchian is profoundly aware that her work and practice aren’t disconnected from the zeitgeist. “I believe that in many ways, the personal is the political,” she asserts. As such, her enduring fascination with intimacy and love is a form of rebellion against the deep sentiment of distrust, fear and suspicion instilled in us by active, widespread governmental hostility. “To me, a lot of my practice is about nurturing both human relationships and the people who look at my work,” she affirms. Future Feminine runs at Fahey/Klein Gallery, Los Angeles from January 18 – February 24, 2018.